Cell phone waiting area for picking up cruisepassengers. Free of charge. Weekends only. You will have to pass the security checkpoint first. Always ask the Officer to make sure wait parking is OK for that day. 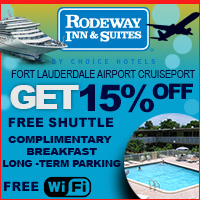 During the week days you would need to go to the nearby Fort Lauderdale Airport cellphone waiting area.